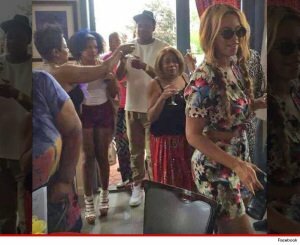 Beyonce & Jay Z SEEM Happy at Non-Paparazzi Ridden Event! The Carters still look an act like a HAPPY COUPLE–even when paparazzi cameras are not around!!! Jay-Z – Shawn Carter and Beyoncé attended his mom’s grand opening celebration of her new restaurant Diamondz N Da Ruff. They showed up for about 15 minutes for the ribbon cutting and that’s it. Sources say Bey and Jay’s mom Gloria Carter hugged and laughed. Who in the heck KNOWS what’s happening here….they are definitely a private couple. I wouldn’t be surprised if we didn’t know anything about a divorce until it was finalized.